This publication has been developed for EUROCLIO – European Association of History Educators by Francesco Scatigna (Historiana Editor) with the support of Joke van der Leeuw-Roord (EUROCLIO Founder and Special Advisor). 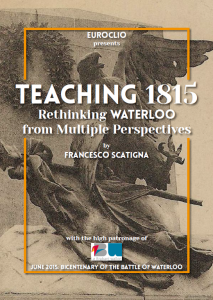 The publication makes use of contributions of participants to the international seminar "Teaching 1815. Rethinking the Battle of Waterloo from Multiple Perspectives". The seminar gathered around 40 history educators from all over Europe to learn, exchange and reflect on "Teaching Waterloo". A varied and dense programme offered participants opportunities to deepen their understanding of the history of the battle, with a special focus on its impact at European and global levels, on the way it is remembered and on the relevance of this topic to teach about war and peace nowadays. The hospitality of the local partners contributed to making this seminar an enjoyable and enriching international gathering of history enthusiasts. Participants learned about the history and historiography of the event and the period and the way they are currently taught across Europe. Valuable on-site learning at the Waterloo battlefield and related remembrance places complemented this programme, oriented towards the collaborative development of teaching and learning resources on the topic as the main outcome of the seminar. The seminar was part of the EUROCLIO International Training Programme that provides opportunities for cross-border professional development to history, heritage and citizenship educators all over Europe. 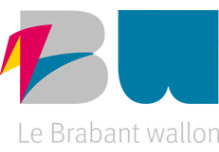 The event was hosted by the Municipality of Braine-l’-Alleud, where the Waterloo battlefield is located. 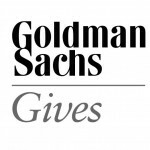 It was co-organised with the Waterloo Committee with the support of Waterloo 200, the Brabant-Wallon Province, the Fédération Wallonie-Bruxelles and the Goldman Sachs Gives. Participants were offered a balance between theoretical insights and hands-on activities during the Seminar. Cover image: Dennis Jarvis (Flickr).